The new year is a time for optimism. It’s a new start, with a chance for new clients, new goals and hopefully new profits. But what happens if in one moment it all goes wrong? Whether it’s a physical disaster, an employee misstep, or a social media-driven attack on your reputation, crisis hits businesses and organizations each and every day. Having some forethought, and a defined communication process and plan in place, can determine the severity of the crisis and ultimately how your business or organization will be impacted. 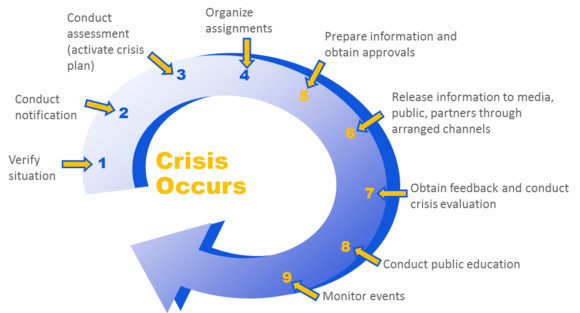 A quick, organized and thought-out approach to a crisis, can significantly lessen the length and impact of the situation. For tips on how to proactively prepare a release to the press for any given situation, be sure to check out our blog. It’s time to channel your business’s inner Boy Scout and “always be prepared.” (Even the Boy Scouts of America have had to deal with a crisis now and then). Here are five steps, plus a bonus step, you can take today to start planning for a crisis. The first step is knowing who will be part of the decision-making process. Who will make the call on implementing a crisis plan and how extensive it may need to be? You need to identify the key decision-makers in your organization. In most cases, it starts at the top with the CEO and/or president and their cabinet members. This group may not address every crisis, but they should be apprised of the direction of most crisis responses. The bottom line, an organization needs to understand where the buck stops when things start to get dicey. During a crisis, it’s important that the company has a clear message and as few voices speaking for the organization as possible. The identification of the spokesperson is critical in the response process as they will be the primary voice for the company during this time. No matter who the spokesperson is, training is vitally important. 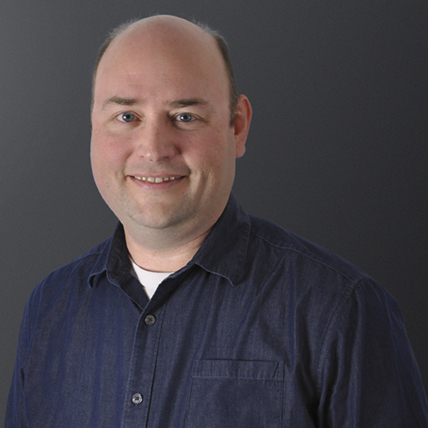 The spokesperson needs to understand and be able to articulate company messages and values. Beyond that, the spokesperson should understand the media and the news gathering process. Once you have your primary responders in place, it’s important to take a larger look at your organization. Who are the people that help communicate on a daily basis, both inside and outside of your company? Who puts content on your website? Do you have an internal communications newsletter? What about posting to social media? Are there key department heads, communications teams, website managers or anyone else who would be vital in a rapidly changing situation? These members of the team will be the company’s significant “doers.” These are the “boots” on the ground that will put your message in motion. It’s critical to identify this portion of the team and include them in any process you develop. This group will be important in implementing any plan you develop and will need to know and understand their roles. Now that you have identified the who, it’s time to start working on the what and how. Start by sketching out the process from start to finish. Be as detailed as you think is needed for your organization, with an eye on how you think things would unfold. Identify the channels you will use to communicate (emails, press releases, social media, etc.) and who will be doing the updates. Consider the chain of command. Who will sign off on the communications? How long should it take? How do you deal with the speed of social media? 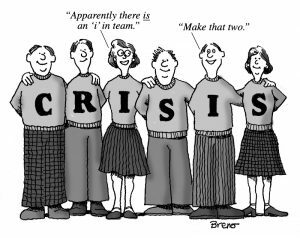 Who takes lead if you need to respond before the full crisis team can meet? Having your process in place, preferably in a document available to all of your key team members, takes the chaos out of the moment. If you know what to do, your energy can be spent on implementing the plan. To this point, all of the planning has been on a generic level. You are thinking about what you would do for a general crisis. Have you considered what the crisis may be? What are the most likely scenarios for your business? Do you have a vulnerability based on your location? Do you handle sensitive information for your clients? Do your employees have direct, physical contact with clients/patients? Have other companies in your industry had to deal with a recent crisis? Most crisis tend to center on personnel, physical space (including infrastructure), or interactions outside of your company (interactions with customers, industry trends, etc.). With a little research and plenty of self-reflection you can identify areas where you might be vulnerable. From there, you can start to think through what kind of response you might have to those various scenarios and plan out specific strategies, create talking points and other resources. Any planning or thinking in this area can go a long way to having you more prepared to deal with whatever situation you may be facing. At this point, you should have all the tools in place. Congratulations. But, the work is not done. It is critical to put those plans into action and make sure you have all of your bases covered. Pick one of your most likely scenarios and have a crisis communication drill. Start with some tabletop exercises where you walk through the process. This will give your team a chance to practice their roles and identify flaws in your process. Even periodic testing will give your team a sense of confidence during a major event. 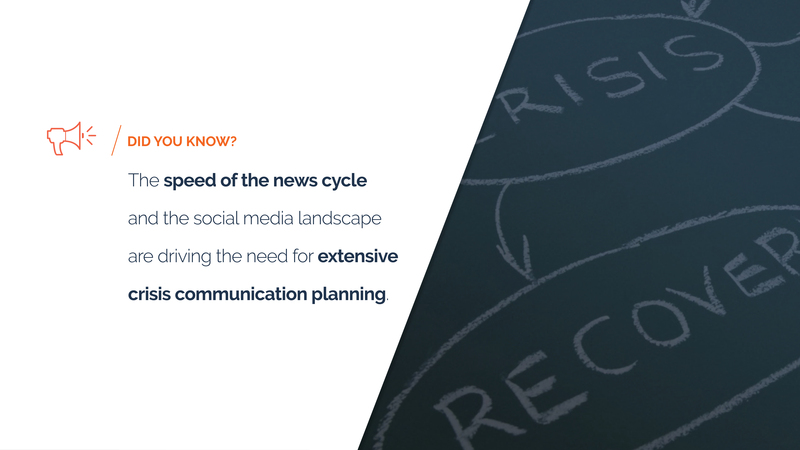 Given the nature of today’s media landscape, smart organizations will understand that a crisis could be just around the corner. The more prepared you are, the more likely it is for the crisis to be short-lived.